That is only a small part of the jobs-hole story, a story that is often ignored, overlooked and oversimplified by mass media. The media has failed to present the unemployment problem, with all its associated economically devastating consequences, in the manner it deserves. It’s possible that unemployment facts and figures don’t translate well for advertisers, or they are too cumbersome to present in a two-minute segment. Whatever the reason, the mass media seem to avoid unemployment details as they would avoid describing and filming fresh road kill during a dinnertime newscast. While some excellent blogs clearly explain unemployment data, such as Mish’s Economic Trend Analysis, Calculated Risk andEconomic Populist, mass media sites are absent. The unemployment rate remained at 9.1 percent for August. Unemployment to the mass media generally centers on that single point within the Bureau of Labor Statistics (BLS) monthly employment report. There is passing mention of discouraged workers and the underemployed, but the true scale of the jobs crisis is given scant attention considering the magnitude of the problem. What follows are 11 unemployment details that mass media underreports or ignores completely. This list will not be recalled fondly as a top-10 list of best quarterbacks or favorite vacation retreats would, but it’s where the REAL unemployment crisis is exposed. 1. The jobs deficit: That is the total number of jobs lost PLUS jobs that should have been created since the recession began in December 2007; as mentioned above, there are 6.9 million fewer jobs today than at the start of the Great Recession, but that tells only half the tale of the jobs deficit. There is also the matter of creating jobs to keep up with the increase in workforce population. Those new workers include high school and college graduates, and immigrants. The number of jobs that need to be created each month to accommodate new entrants into the workforce ranges from 120,000 – 150,000. Adding together the jobs lost since the recession and the new jobs needed for population growth, the total jobs deficit is estimated to be 11.3 million. A few tax breaks, some targeted workforce retraining and some regulatory relief for businesses are not going to be the forces behind the creation of more than 11 million jobs. A massive effort is required to fill that gaping jobs hole. It’s striking that the economy has created only 105,000 jobs during the past three months. When considering only the new entrants to the workforce, such as recent college graduates, that three-month span produced a shortage of 270,000 or more jobs. 3. The Birth/Death Model: This is not births and deaths of people, but of businesses. The BLS estimates how many jobs were created or lost by business formations or closings. In August, the BLS estimated that 87,000 jobs were created by new businesses. To illustrate just how wide this model can be off the jobs mark, Bloomberg shows that 824,000 jobs “disappeared” after a birth/death model adjustment in February 2010. That adjustment is important because if it was known that job creation was weaker by 824,000 jobs during 2009, additional job creation efforts could have been considered. At present job creation is stagnant and we won’t know what role the birth/death model has on today’s job numbers until 2012. But if history is any guide, job creation may again be overstated. 4. JOLTS (Job Openings Labor Turnover Survey): This monthly BLS report gives an indication of the number of available jobs. On the occasion that it is mentioned by the media, it offers only a sliver of the issue, such as the number of unemployed per job opening, which stands currently at 4.3. What is missing from that JOLTS report? Plenty. First, the 4.3 unemployed per job opening is limited to the 14 million U3 unemployed (the 9.1 percent). But those aren’t the only unemployed wanting a full-time job. There are the 2.6 million marginally attached workers, 8.8 million underemployed (those who want full-time work, but are working part-time). I’m not going to include the 3.9 million non-unemployed unemployed (explained later). When those 11.4 million workers are included with the 14 million U3 unemployed, there are 25.4 million workers and 3.2 million jobs, or 8 unemployed or underemployed workers per job opening. It’s important to know how many job openings are part-time, since part-time jobs usually pay less and offer fewer, if any, benefits. Extrapolating from the BLS “Employed persons by class of worker and part-time status” data, there are 139,627,000 employed workers, of which 27,034,000 are part-timers. More than 19 percent of all workers work part-time. If nearly 20 percent of all available job openings are part-time, there are only 2.56 million full-time jobs for 25.4 million unemployed and underemployed who want full-time work, or 10 workers for each available full-time position; more than double the 4.3 workers per job opening touted by most media outlets. 5. The participation rate: Is, according to the BLS, “The labor force as a percent of the civilian noninstitutional population.” Or, more simply, the percentage of the working-age population that is working or is actively looking for a job. The participation rate rose 0.1 percent in August to 64 percent, which is slightly above the 27-year low recorded in July of 63.9 percent. If more jobs were available would there be more participation? More than likely that would be the case. The mass media very seldom mentions this point, but the participation rate shows the potential number of people waiting on the sidelines for the job market to improve before they jump back in. A couple of striking graphs of the historical participation rate can be seen at ZeroHedge and BLS. 6. Marginally attached workers: From the BLS, “These individuals were not in the labor force, wanted and were available for work, and had looked for a job sometime in the prior 12 months. They were not counted as unemployed because they had not searched for work in the 4 weeks preceding the survey.” I know, it’s not an easily digested description, but it’s a population of unemployed that want to work, but for various reasons have not looked for work recently. Currently 2.6 million workers are considered marginally attached. If they are included in the unemployment rate, that rate increases from 9.1 percent to 10.6 percent. 7. The underemployed: Who are the underemployed? “The number of persons employed part time for economic reasons (sometimes referred to as involuntary part-time workers). These individuals were working part time because their hours had been cut back or because they were unable to find a full-time job,” states the BLS. The August employment report indicated that underemployment increased from July by 400,000 to 8.8 million. Part-time jobs range in hours from one to 34, any job of more than 34 hours is considered full-time work. That might not be the case in the real world where a full-time job is considered 40 hours, but that is the case according to the BLS. 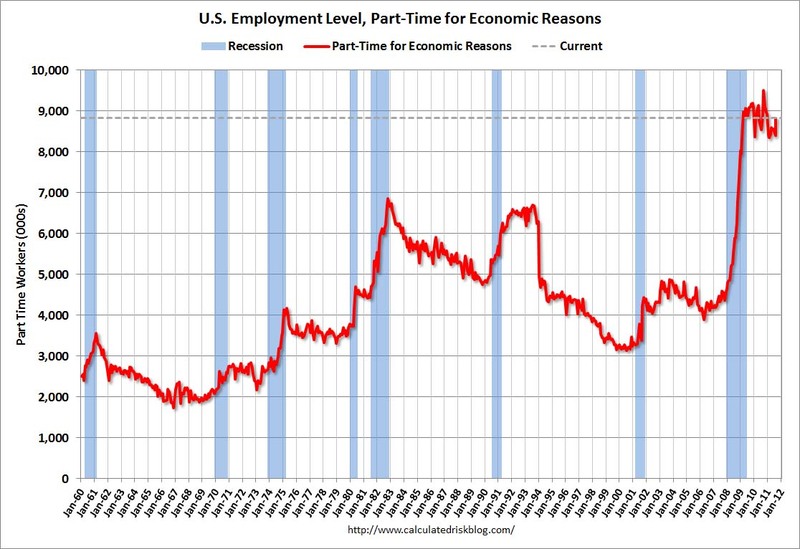 While some believe that part-time jobs eventually translate into full-time jobs, that hasn’t been the case during this recession, as the linked graph from Calculated Risk illustrates. From 2000 to 2008, the number of underemployed ranged between 3 and 4 million. There are currently 4 million more unemployed than at the start of the recession. Businesses would need to see a dramatic uptick in business to place 4 million more part-timers into full-time slots. The “real” unemployment rate increases to 16.2 percent when the underemployed and marginally attached workers are considered. 8. The not-unemployed unemployed: Yes, there is a point at which the BLS stops considering an unemployed person unemployed. That point is reached when an unemployed person has not looked for a job in the previous 12 months. When asked, the BLS replied, “The 3.9 million individuals not in the labor force that you are referring to responded that they wanted a job, but had not looked for a job in the last 12 months. They are not considered unemployed because they had not actively searched for work in the four weeks preceding the survey.” I recall no mention of these 3.9 million from any mass media outlet. This 3.9 million are the most discouraged of discouraged workers, but if the jobs market was improving, these millions would start to become part of the unemployed once more. If these 3.9 million were added to the “real” unemployment rate (U6) the rate would increase from 16.2 percent to 19 percent. Nearly one in five American workers is either unemployed or underemployed. Why isn’t that disturbing fact in the media spotlight every day? 9. The long-term unemployed: These 6.0 million are the jobless who have been looking for work for 6 months or more (this does not include the not-unemployed unemployed). Long-term unemployment receives occasional mass media recognition, but it scratches only the surface. There are subsets of the long-term unemployed that show the depth of the problem more clearly. The 6.0 million long-term unemployed represent 43.1 percent of all unemployed. Of that 6 million, 4.458 million have been jobless for 52 or more weeks and within that group 2.040 million, a record high, have been unemployed for 99 weeks or more (not to be confused with the “99ers” explained below). Even more startling than those numbers is the lack of response by lawmakers. 10. 99ers: These long-term unemployed have exhausted all unemployment benefits (not all unemployed collect unemployment benefits). The name “99ers” comes from the fact that some collected benefits for up to 99 weeks. It’s a misnomer in the sense that only about 25 states are eligible for the 99 week maximum; many unemployed exhausted benefits in as little as 60 weeks. Official statistics are not kept for this unemployed population. When Mish Shedlock of Global Economics Trend Analysis was asked about the 99ers population, he contacted Tim Wallace. Wallace has been digging into long-term unemployment data to try and weed out the number of unemployed who have exhausted all unemployment benefits. His most recent efforts show that, “we can safely assume that 3,058,152 people have exhausted all benefits — they are no longer covered on either sets of (unemployment) rolls.” But it doesn’t end there, using some additional Department of Labor data Wallace pries out another 2.0 million 99ers, for a combined 5.1 million. Other 99ers estimates range from 1.5 to 5.0 million, but as the linked graph at Here come the ’99ers at Calculated Risk illustrates; the number of unemployed that are exhausting unemployment benefits is rapidly increasing. While there may be disagreement about the total population of 99ers, Wallace concludes, “There is absolutely NO EXCUSE for this to not be a readily accessible piece of data daily. After all, Walmart can tell you how many strawberry Pop Tarts they sold yesterday.” There is also no excuse for the mass media ignoring this vast unemployed population and not taking agencies to task for not reporting accurate 99ers data. Millions of additional unemployed will become 99ers immediately unless extended unemployment benefits are renewed in December. A worker laid off today will be eligible for only 26 weeks of state benefits unless an extension is approved by a much divided Congress. How can an economy function when so many are out of work and have exhausted unemployment benefits? 11. How many unemployed collect unemployment benefits? It may seem reasonable to assume that all 14 million unemployed collect unemployment insurance benefits, but that is not the case. In September 7.17 million unemployed collected benefits, which is only 51 percent of all unemployed (U3, the 9.1 percent). Surprisingly, on average just one third of all unemployed are eligible for unemployment benefits at the state level (2011 data). As an example, temporary staff, self-employed and recent high school and college graduates may be out of work, but not eligible for benefits. Eligibility rates range from 57 percent in AK and PA to TX at 21 percent. Each state can set its own guidelines regarding eligibility requirements. When someone tells you they are unemployed, it’s more than likely they are not collecting unemployment benefits. Many pundits and some GOP lawmakers excoriate all unemployed for being lazy and enjoying life on the dole. Sen. Jim DeMint (R-SC)recently said, “People are gaming the system and refusing to take jobs because they get unemployment benefits and food stamps.” That naïve and cruel assessment disparages all unemployed, but it’s particularly insulting to the majority of unemployed who aren’t eligible to collect or have exhausted unemployment benefits. If Sen. DeMint and his ilk want to see where the system is being gamed, he may want to look at Wall Street instead of Main Street. What message can be taken from this list of realistic and discomforting unemployment figures? The bottom line is that unemployment is much worse than the 9.1 percent unemployment figure pushed by the media and many lawmakers; in fact it’s considerably worse. Mass media’s inability to communicate the depth of the jobs crisis is one reason the response to it has been primarily weak and ineffectual. If the media mutes the crisis, lawmakers and corporations will continue to act slowly and impotently, forcing millions of American families to suffer needlessly. Unemployment and jobs creation are national emergencies demanding focused attention with a wide-ranging and rapid response. This American jobs disaster will not vanish if neglected, but what will vanish are the hopes, dreams and financial well-being of millions of hard-working Americans. This was first published at AlterNet.org. Interesting that in all these unemployment post that the illegals workers in America are never addressed? There are an estimated 12 million illegals in America with jobs and another 10+ million documented workers. These are people here working for a decent wage like $14 an hour and up. So why is there no mention of these issues in unemployment articles like this? Great article! If you are one of those unfortunate unemployed who is considering writing your own resume you can view resume samples on FreeResumeExamples.net where over 50 professional resume writers have uploaded their resume examples to view and download.